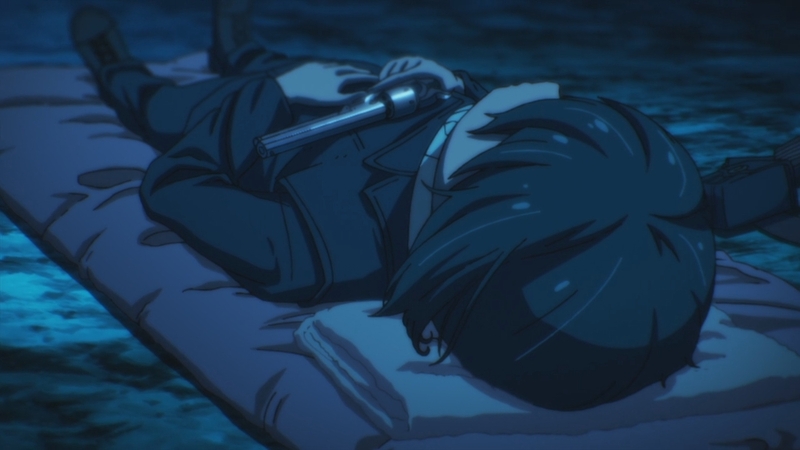 I’ve been a fan of “Kino’s Journey” for several years, and the story becomes even more interesting to me as I delve into its philosophy. The 2017 “Kino’s Journey: The Animated Series” has opened my mind to questioning ideas as I connect the dots back to the 2003 mini-series. I recommend watching both series, as 2017 is a continuation, even though Nakamura, the original director, passed away in 2013. In terms of character appearance, the 2017 “Kino’s Journey” may not seem different from other anime. It’s “moe,” and good or bad, it does stray from the original 2003 series in terms of aesthetic appeal. How does design tie in to “Kino’s Journey”? Outside of anime appeal, there are theatrical roots. The main character named Kino tries to stay ambiguous, but she’s a recognizable character to other characters, and the audience. People are often surprised to find out that Kino is a girl, and that is part of the brilliance that “Kino’s Journey” brings to mind. It’s not just a “gotcha,” it’s a clever device, and design, for something meaningful. The 2017 Kino, while more aggressive and hands-on in countries’ affairs, still brings relevance to questions of humanity and implications of culture and societies on the world. But who is Kino, really? Who was she before? What is her real name? Sigsawa, the author of “Kino’s Journey,” leads us in openly questioning the narrative and its characters. After all, unusual cultures and the change of individual people can have several angles of explanation. In this episode, Kino visits a country where people lie. The people, however, know they are lying. In “The Land of Adults,” where Kino was born, her home society was a collective mentality built upon brainwashing. Happiness and youth did not exist: only being an adult mattered. Kino has a unique personality complex that is developed through, what arguably can be, real world situations. Before taking the name “Kino,” the girl’s journey technically begins at the point she sees the original Kino murdered. From that point, the girl assumes Kino’s identity when she introduces herself to Hermes, the anthropomorphic Motorrad. The new Kino’s transition to a more masculine appearance is not solely from the man named Kino. She only knew him for three days. Kino’s personality and appearance instead take fruition when she is with her master, an older woman who only goes by the name Shishou. Shishou teaches Kino all she knows about travel and survival, from daily chores to cutting through thick trees with a machine gun. A younger Kino with her master, Shishou. Kino is meant to be an analog character, but let’s look at her in another way. Individual characters, their histories, and their personalities in this series are up for debate. 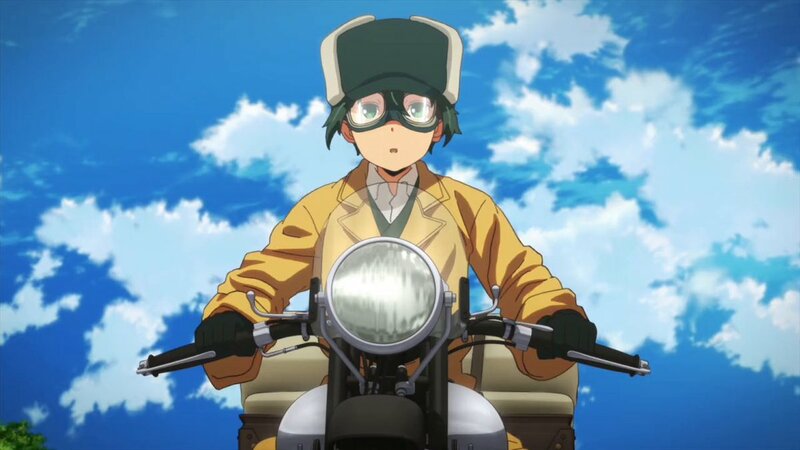 After all, “Kino’s Journey” is all about countries, people, and their cultures and traditions. Kino is not exempt. Kino’s role models influenced her to become a traveler. Especially considering her biggest influences are from outsiders who did not choose to settle within one country’s standards. Kino’s parents were, to say the least, terrible role models. Kino in her signature uniform. The jacket belonged to the original Kino, while one of the weapons she carries was originally Shishou’s. Gender can be important or unimportant, regarding the indifference of individual story contexts separated from Kino’s personal history. However, one topic that cannot be ignored is the flower, a symbol of fragility and femininity. Flowers are a focus on Kino’s character, from when she became “Kino,” and throughout her journey when she reflects on her past. What do Zeami, Noh, and roles have to do with Kino? Zeami Motokiyo is a playwright theorist of Noh from the 14th century whose teachings are becoming increasingly recognized in the West. In his playwright theories, Zeami identifies the importance of flowers, and flowers have a double meaning in Noh concept. 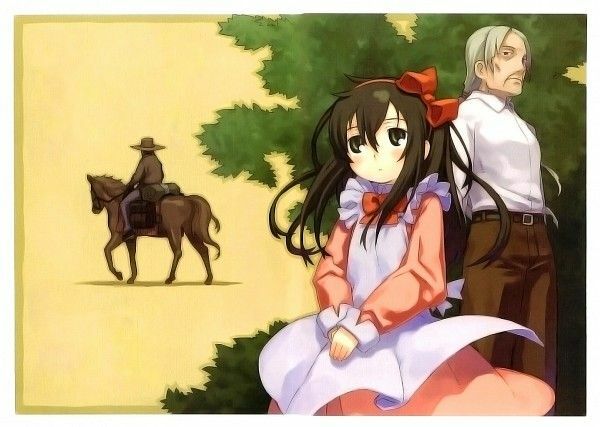 Young Kino in the field of Sakura, where she and Hermes first introduced themselves. Here’s where applying the concept gets muddied. Kino could be based off the “real flower.” Kino is still human, and just like a real flower she will age and die. Gerould notes, “We might then forget that, for a flower, to be ‘real’ means to bloom for a brief, precious moment.” Was Kino’s “blooming” moment when she saw the male Kino murdered? When she took the name of Kino, was that when the flower died? What did she become afterwards? Kino could also be a “transitory flower,” in regards to her transitional mindset from a young girl to a traveler. Kino takes on a different appearance, attitude, and view of the world. Transitory, in Noh standards, is forever youthful in appearance. However, the “transitory flower” also fools people. After all, most people assume Kino is a young boy. The young girl essentially became the rebirth of the male Kino in ideology and physical presence. Upon his death, her original name (what we can assume to be Sakura from both its symbolic meaning, and the similar past with the girl at the end of the 2003 series) withered away. At the start of the 2017 series, Kino and Hermes are camping in the forest. Kino thinks of herself as a terrible human being, obviously still in a “transitory” state and questioning the motives she took after the death of the male Kino. Along her travels, she has killed people. Did the male Kino also kill anyone?